During this arctic cold spell in the Canadian Rockies, walking outside is like walking into a deep freezer. Though the Mountain Moxie team was still getting out, we did spend some extra time indoors which was a great time to catch up up on our review of Rab’s latest high-end down offerings. New for 2016, the Rab Positron jacket makes an excellent ice and mixed parka, markedly improving on the jackets it’s built from. 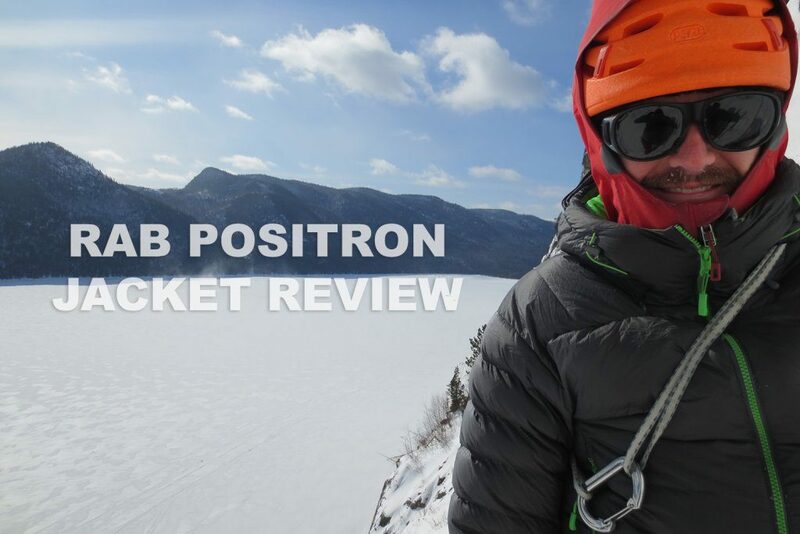 PRODUCT OVERVIEW: The Rab Positron jacket is the evolution of their previous lightweight box-wall constructed down parka, the Neutrino Plus. I’ve used the stitch-through constructed Neutrino Endurance extensively and Rab is pretty accurate in their statement that this jacket is a “benchmark technical down jacket for […] lightweight ascents”. I’m happy to report the Positron improved on some shortcomings of older versions of the Neutrino Endurance jacket. SIGNIFICANT FEATURES: A major feature for this jacket is the strategic placement of down construction. By selectively using box-wall construction, the down has more room to loft. By using this box-wall construction throughout the front and back of the core and the hood, Rab eliminating any cold spots in these areas. By using stitch-through construction for the arms and sides, the jacket feels much less bulky, making it reasonable to follow a pitch in the jacket on very cold days. Since this jacket has a significant history of evolution, it features a tried-and-true fit (long torso and arms) and Rab’s latest hydrophobic down. TEST LOCATIONS: The jacket has been tested for a full season (2015/2016) of Canadian Rockies ice and mixed by 3 different testers. Testing occurred mainly on multi-pitch, sometimes remote routes like La Goutte (WI6) and The Andromeda Strain (V M6 WI4). Additionally, the jacket has been tested by two different testers during a 3 week trip to Quebec. Down to -35C we mostly focused on multipitch ice climbing with several WI5 lines. OUTSTANDING FEATURES: The comfort of the box-wall construction can not be overstated. The additional wind-block from this construction was very welcome on cold and windy days. In addition to the construction, Rab made some excellent material choices that shine in their light weight. The Pertex Endurance outer fabric is essentially industry standard on any high-end down jacket. The coated nylon fabric is essentially 100% windproof and highly water resistant, but has excellent breathability. This is an oft-overlooked feature for a down coat. Without a highly-breathable outer fabric, any moisture that has been in contact with the down gets trapped. A big disappointment for me with the Neutrino Endurance is the pocket placement: since they were set right at the hem, it was easy to feel the cold coming through the thin pocket liner. (This appears to have been fixed also on the current Neutrino Endurance!) With the Positron, the higher-set pockets end in the middle of the down baffles, allowing the hand-warmer pockets to do their job. This is now a feature I look for on any big parka! The hood provided excellent coverage, to the point where testers were breathing into their down jackets since the zipper came up so high (not recommended). The hood has a light-weight velcro tab that allows you to roll down the hood when it’s not in use. This new system is much slicker than the previous one. WHAT WE LIKED BEST: For me, the newly located hand warmer pockets made a huge difference. While climbing this might not be a big deal, but hanging around basecamp became much more comfortable because of this. Appreciated a correctly-sized stuff sack. Easy to use with gloves and easy to clip two points for hanging off the harness. If you’ve ever climbed with a Nano-puff clipped to your harness, you know how thin that tiny piece of cord looks. NOTES & RECOMMENDATIONS: The 275 grams (size L) of fluorocarbon-free dry-treated down adds water-resistance and faster drying times. This was noticeable in the field (slightly wet spots were dry by the end of the day) and at home/hut (the hydrophobic jackets dried much quicker overnight!). The jacket comes with a roomy stuffsack, allowing some loft retention for the jackets while on the back of the harness and easy stuffing with gloves on. Testers found the size of the stuffsack adequate for clipping on the back of the harness and appreciated a roomier stuffsack (for a change). At the top of Ectoplasme (140m WI5+) on the first ascent. Nipissis, Quebec. AREAS OF IMPROVEMENT: The main zipper ended up catching quite often, causing the internal draft collar to catch and rip. Since this was a sample jacket, this might have improved with the evolution of the design. DURABILITY: The Pertex Endurance used as the outer fabric held up well to the abuse. Rab uses 800 fill-power, dry treated down as the insulation. While this dry-treatment doesn’t add to the durability, it allows the down to dry faster, adding to the versatility of the jacket. As with any down equipment, it’s worth having some tape or seam-grip (on longer trips) to repair any rips in the baffles. RECOMMENDED USE: COLD weather ice and mixed climbing. Would make an excellent Rockies winter/Alaska summer/winter jacket or any other expeditions to 5-6000m peaks.